Wow we're back on our regular schedule! That evening posting just seems weird, we get together over coffee right? 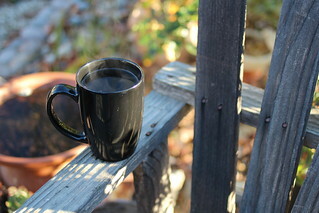 My coffee is sitting there on a chair covered in frost, not sure you can tell from the picture, but there's a tiny ring at the bottom of the cup where the frost is melting away. The whole yard was sparkling. Ok sure, it's not snow but pretty chilly for here! Especially lately! The banner swap isn't the only swap I'm involved with this year! I want to do more sewing and different kinds of things, and when Donna asked me if I'd like to participate in her Sew Sweet Bee, I said sure! Luckily it's a pieced block swap, so I should be able to handle it! 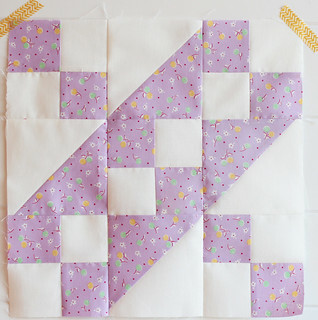 Donna chose the Jacob's Ladder block and you can see the first one she received from Renee here! Of course already I can see I'm not the coolest swapper ever, look at all the little goodies that came with Renee's package! Next month were' sending log cabin blocks to Clara at Clover and Violet! I can't wait to pull out some fabrics and get busy. I have a sew day coming up with the Debbies so I've been getting a kit together to work on. I'm making Minnick and Simpson's Liberty Road. It's a great flag quilt, and I'm using the layout I photoshopped and shared here. And I haven't forgotten about the hello project.. don't worry. Now tell me, what are you up to? Cold down here in long beach too but I am not complaining looking at what our friends are dealing with in Midwest and east! Not much sewing going on, tonight going to prep five more French Roses block. It's my Project 48 for this year and I can actually see a little progress. Have a great day Pam. Oooh Yummy -- I can't wait to see that flag quilt! I would send you some snow to keep your frost company if I could -- It's Beautiful back here!!! Pretty block you made for Donna! Everything you make is so cute, I love your new Pam Kitty Picnic fabric, just got some of the yummy butter yellow with little flowers in the mail yesterday. Can't wait to sew with it! I am super excited that you are making me a block too!! Thank you!! I'll trade my icy slush for your sparkling lawn! Love that M&S quilt pattern... I've been seriously considering doing their other flag quilt (Hurrah) with the zigzag-y border.